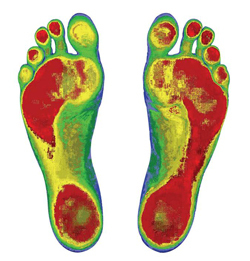 An impression of your feet reveal pressure points, loss of arch and other critical information. First, we use a weight-bearing casting impression capture an imprint of your feet while you are standing in a normal, weight-bearing stance. This captures areas of stress on each foot. They are used to analyze your feet. Up to 16 different data points are used to create a unique, one-of-a-kind shoe insert designed for your specific postural or structural challenge.